Summer lasts a long time in Hong Kong. We were swimming by April and now in late August we’re tired of the heat. It seems we’re always longing for the next season. Adjusting to life in a tropical country is always hard, especially for people like me raised in the North. I can handle the cold. I went to school at St. Lawrence University in upstate New York – above the Adirondacks. Driving there we went through Syracuse then continued another two hours straight North. One day it was -35 degrees Fahrenheit (-37 Celsius). Advisories were issued suggesting people take shallow breaths when outside. Your windpipe wasn’t able to warm the air before it hit your lungs. Here it is the opposite extreme. The Hong Kong Observatory issues a “Hot Weather Warning” any day it is going to be above 33 degrees Celsius (91.4 Fahrenheit). In July and August we had these alerts nearly every day. In the last week of August they’ve tapered off slightly. Bring me back a snowball? My friend Robyn puts it down to the lack of shoulder seasons. There is no autumn and no spring. Those seasons last a day or two before the advent of a nine month summer and a three month winter. My son and his friends talk about snow. He’s never seen snow other than in the movies. One year I went to Chicago in December and he asked me to bring him back a snowball. I couldn’t. So instead he asked me to have a snowball fight. I took one in the kisser for the camera and him. 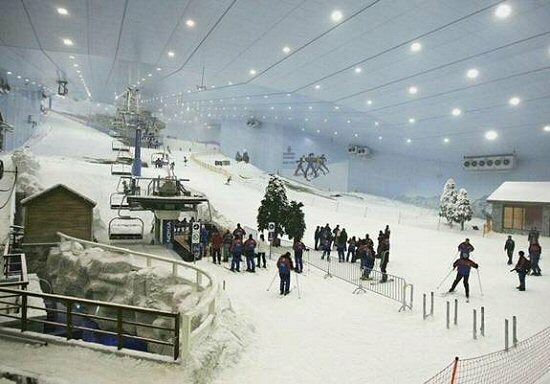 Dubai is also a hot country and they solved the lack of winter by building an indoor snow skiing mountain. This artificial wonderland allows desert dwellers to enjoy the snow for an hour or two. Hong Kong lacks the space for such a place. Instead our shopping malls frequently house ice skating rinks, even in the midst of summer. Soon we will have winter and living in the New Territories I expect it will be colder than I’d find comfortable. There may even be a week or two where you’ll need to dress in sweaters or even a light jacket. But by then we’ll be complaining of the cold and wishing it was summer. In Hong Kong, we’re always longing for the next season. I will send you some snow!!!!! !